Starting at $7.50 per person per game - please see Promotions for our special pricing options. We typically play a 12 minute game or 21 lives - whichever comes first. Laser tag is a fast-paced live action sport that we like to call "paintball without the pain". It's like participating in your own video game. Laser tag is fun yet so many people, particularly adults, initially resist it. Maybe it's the fear of the unknown. Once you've tried it though, we think you'll be hooked on the fact that it's fun for all ages! Laser tag is painless and safe. 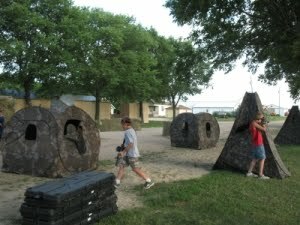 Laser tag can be played in small groups or large groups, with family, friends or co-workers. Laser tag encourages teamwork and strategic thinking among the players. We love to watch the strategies that develop as the game progresses! Laser tag is a universal activity known in many countries. It is loved and enjoyed all over the world by people of various ages and lifestyles. Once you've played, you'll wonder why you waited so long to try it! We offer both an indoor and two outdoor options, each with a unique battlefield. Our indoor option features multiple levels and is air conditioned! All courses can be played any time of day in all seasons of the year as weather permits. Laser Barn is open year-round. The Laser Barn can come to you! Please call or stop in to our location to discuss options for mobile events. Consider us when planning a post-prom, company picnic, family reunion, or graduation party! Mileage rates may apply.